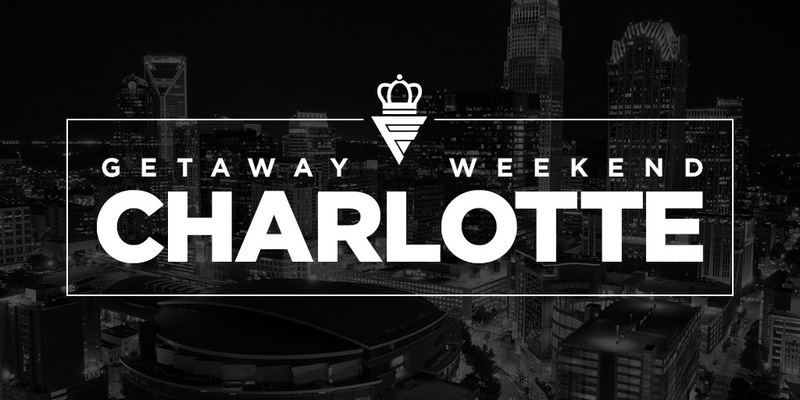 The Charlotte Getaway Weekend is a premium experience brought to you by the First Impressions Conference. We’re offering three dates for the remainder of 2019. Getaway weekends include three days of training and observing – including three days of workshops, team building exercises, and first impressions training from Greg Atkinson, Mary Ann Sibley, Rebecca Carlisle on the Sunday experience, and also include visits to three churches in Charlotte who excel in guest services, and also includes some fun and relaxation while “talking shop” with like-minded folks. Once you arrive in Charlotte, the weekend is all-inclusive. We cover 3 nights of hotel (starting Thursday night), all your meals, teambuilding activities, and your transportation around the city. Limited to 10 people. Register today! “For me, the best part of this weekend was that it was a small group of people who are all doing the same thing, all working towards the same goals. The ideas, encouragement, and friendships formed this weekend were so much greater than anything I could have expected going into it. Already, within 24 hours of being home, I am seeing changes happening that will make my team even stronger and have so many more yet to come. I strongly endorse the First Impression Conference to any and all church groups that want to increase their impact on the guests God calls and draws to their church, with a spirit and culture of sincere love and excellence in their preparation to receive and care for the guests as they come and throughout their church experience. This group does an awesome job at getting people to see and experience what the first time guest experiences and create an environment for them which makes their visit to our churches a smooth and comfortable one. If you are looking for a great weekend with like-minded people who will give you support, a weekend away, and a time to be refueled, this is the weekend for you! I highly recommend attending a First Impressions Weekend Getaway! The leaders are very engaging, real, and truly show a passion for the first impressions ministry. The conference will refresh you and motivate you with a new vision for your ministry! First Impressions leaders Greg, Mary Ann, and Rebecca are remarkable high-energy leaders who made our Weekend Getaway in Charlotte Oct. 19-21, 2018, spectacular. Their love for the Lord inspires them to set high personal goals to deliver their messages of how important Guest Services Ministry is for every church, big or small, and they inspired me to do the same. “I highly recommend attending a First Impressions Weekend Getaway! The leaders are very engaging, real, and truly show a passion for the first impressions ministry. The conference will refresh you and motivate you with a new vision for your ministry! Don’t miss this! You’ll not only receive access to Greg, Mary Ann, Rebecca, and the other attendees during the weekend, you’ll also be added to a private mastermind group where you can continue the conversation with continued access. If you’d like to be kept up-to-date about upcoming weekends as they are planned, drop us your contact info below. We promise to make it worth it! Want to bring your entire team? Contact us at info@firstimpressionsconference.com and let’s discuss a custom experience. 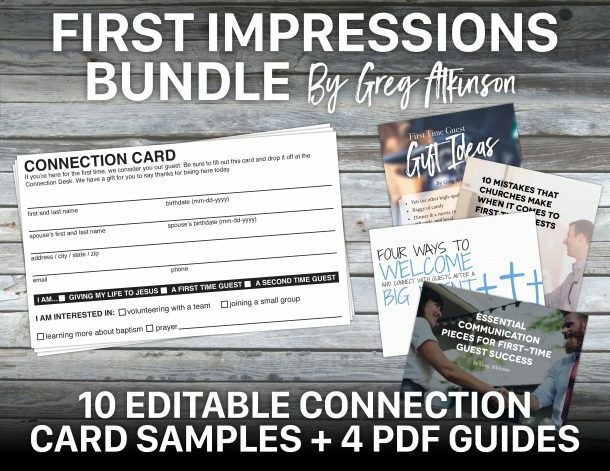 © 2019 First Impressions Conference. All Rights Reserved. Click to watch a video. Click here to download the “Man Code Audit” companion resource. Enter your info below to download a free bundle of goodies to help you with your guest experience. Includes 10 editable connection/communication cards (in a variety of file formats) plus four PDF guides to help you do guest services better.